At 20:40 Katie Witkiewitz begins discussing the use of tDCS as a tool for enhancing mindfulness training. Her work is mostly focused around addiction and recovery. She compares her own experience of using tDCS-assisted meditation to day 4 of a multi-day meditation retreat. They are using the anode F10 / cathode left shoulder (“Where’s Waldo” DARPA research) montage. There’s a shot of what she calls the ‘octa box’ which seems to be distributing current from a single ActivaDose device to 8 sets of electrodes for ‘group mindfulness training’ (but I could be wrong). Could tDCS enhance your meditation? Provide that extra bit of calming the chatter? She goes on to say that (including her own personal experience) the montage ‘inhibits verbal ability’ and that trying to lead a guided meditation while stimulating F-10 gave her ‘the worst headache’. We met Ana Maiques, the co-founder of Neuroelectrics, maker of StarStim, in our first podcast. It should be pointed out that StarStim is a research-grade tDCS/EEG device that includes a powerful suite of software. In fact it’s not available to the general public. She invited me to throw ten darts before being brain-hacked, and ten darts after. And, while the current was gently sizzling through me, she played me a tape in which a man calmly talked me into picturing how brilliantly I was going to throw those arrows. There is no point undergoing tDCS if you’re not already mentally focused. Davis compares it with a weightlifter taking steroids. ‘If he takes them without pumping iron, they won’t give him bigger muscles,’ he says. He also summons the example of Andy Murray going back to his chair between games, and replaying in his mind the shots he has just played, as well as imagining himself walking up to the net as the eventual winner. It’s called visualisation, and all modern sportsmen and women are encouraged to do it. Davis thinks that tDCS could help them do it better, sharpening that mental imagery. That’s why he’s experimenting on people like me. First I needed to put my thinking cap on. 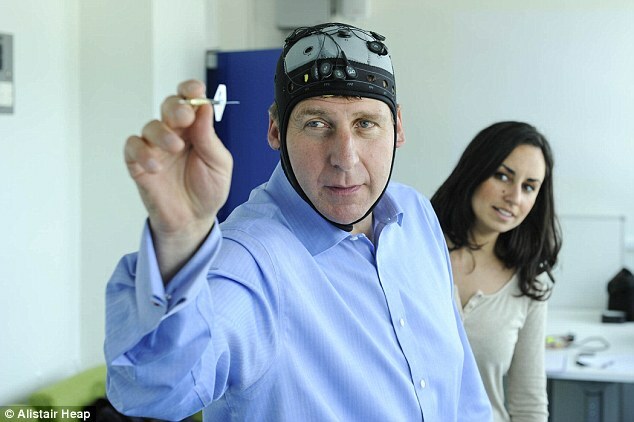 This is the StarStim, a rubber hat with electrodes dangling from it. Made in Barcelona, it costs £7,000. Thync works by pulsing small electrical currents, no more than about 20 milliamps, through nerves on the head. A sticky strip of electrodes attaches to places where nerves run close to the skin above the right eyebrow, behind the ear, and on the back of the neck. A small triangular device connects above the eyebrow, and sends electrical pulses out through the electrode strip. According to Jamie Tyler, Thync’s CSO and other co-founder, the effect of pulsing currents along these nerves is to modulate norepinephrine production in the brainstem at the back of the head. The device has two main modes—called “vibes” in Thync-speak—calm and energy. The difference between these two is that energy increases the release of norepinephrine, increasing alertness, whereas calm decreases it. Despite thousands of studies, there remain many mysteries. Most studies involve extremely short experiments with few participants, and they often assess results after just a single session, using very specific tasks. That means results are not generally applicable to real-life situations or to all people. And nobody knows what the consequences might be of frequent use for long periods of time, which is how many people would like to use tDCS. results in suppression of the vestibular system. Effect of tDCS Current on Single-Pulse MEP (motor evoked potentials) Amplitudes This figure taken from Batsikadze et al. (2013)) shows that the “classic” inhibitory profile of 1 mA of cathodal DC stimulation is reversed when intensity is increased to 2 mA. The Effects of tDCS Polarity. 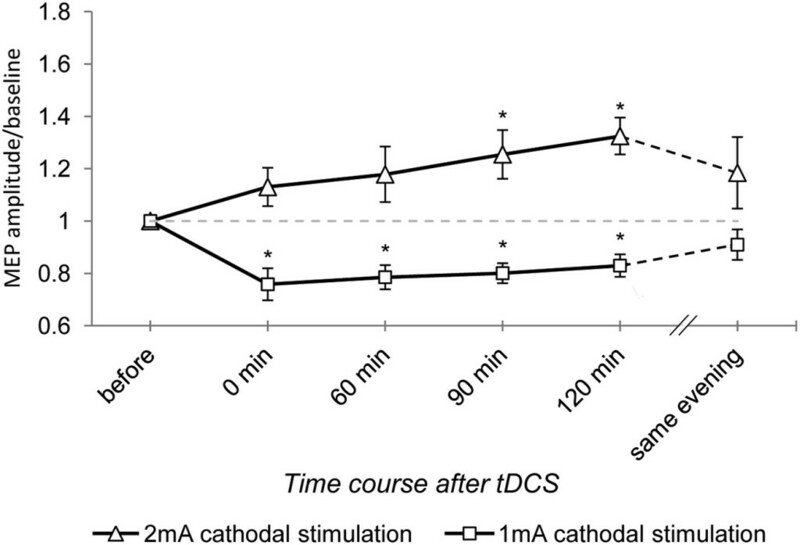 One of the features of the literature in tDCS cognitive studies is the implicit assumption that anodal stimulation is always excitatory and cathodal stimulation is always inhibitory (see Horvath et al., 2015a). Bestmann et al. (2015)) have given a detailed account of why this cannot be the case. It is broadly true that polarity-dependent tDCS changes are directional; however, the effects are not uniform under the electrodes (Batsikadze et al., 2013) and interactions with different cell morphologies and cortical surface shapes create inhomogeneities that in turn change the net effects of stimulation (Bestmann et al., 2015). This is one reason to approach the link between assumed physiology and behavioral effects with caution. It is an important message of this Primer that the field needs to stop making naive one-to-one links between polarity and behavior.